Umami – the fifth taste – is held in holy regard by the Ningbo community and it shows in their food. 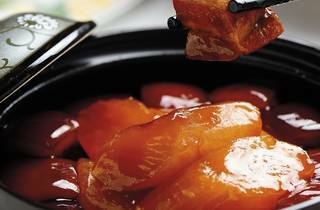 Meats are stewed until they swell with the essence of homemade sauces. Salted vegetables are showered over freshly caught seafood to draw out the delicate flavours. It’s a beautiful thing when done properly. For the most part, Wen Ding Yi Hao does well at recreating the flavours Ningbo cuisine is renowned for. The head chefs hail from the restaurant’s mother company in Zhejiang and are all well-versed in the regional style of cooking that defines most of the menu. Unfortunately, the same authenticity doesn’t translate to the physical space, which is a loud and garish mishmash of faux European glam. Ivory white and gold Victorian-style chairs that look like they were stolen from Disneyland’s castle are set around carpets adorned with massive floral prints. It’s best to focus on the food and ignore the décor. Simple dishes are done particularly well here. A traditional, homestyle dish takes fleshy stalks of bok choy and braises them in a sugar and soy sauce reduction ($58). The result is sweet, sticky and saline all at the same time. In another delicious starter, thin slices of heavily salted boiled pork ($98) appear with strips of fat that melt like brackish butter on the tongue. There are milder offerings. A serving of crystal rolls ($68) sees thick stacks of roughly chopped leafy greens wrapped in translucent rice flour sheets punctuated with black sesame. The dish is passable but boring compared to more robustly flavoured items. 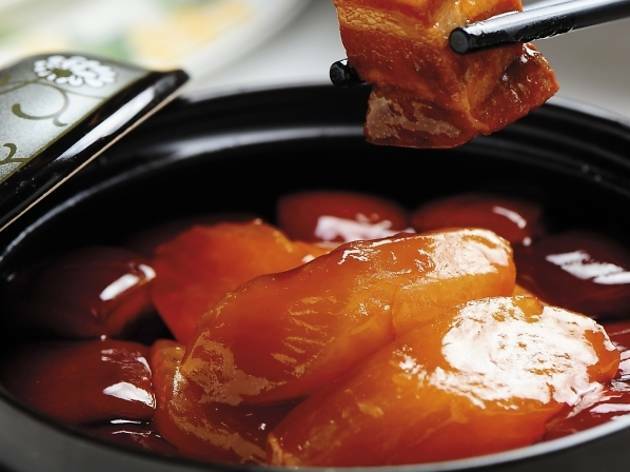 The signature red-braised pork ($198), for example, arrives in a heavy black pot with hunks of meat and daikon radish that have been dyed dark brown by the marinade. Gentle notes of star anise linger in the sauce and soak deep into the layers of gelatinous pork fat. This is the sort of food that the restaurant’s chefs really excel at. Though Wen Ding Yi Hao comes close to a fully authentic Ningbo dining experience, there are instances when ‘close to’ is still a little too far. Such is the case with the restaurant’s stir-fried river shrimps ($198), which are surprisingly insipid, devoid of the delicate sweetness one would expect to find in freshwater shellfish culled from the clean waters of Jiang Su (so the menu claims). Thankfully, the disappointment is tempered by the accompanying basket of deep-fried beancurd, which are shaped into marble-sized pellets and remain silky and supple within a crispy, peppery coating. The stir-fried rice cakes with crab meat ($168) could also use some tweaking. The dish graces the table with flecks of bright orange roe clinging to the chewy white rounds of sticky rice dough. It’s enticingly fragrant on arrival but borderline bland on the palate. Ending the meal with Ningbo-style glutinous rice flour dumplings is pretty much de rigueur. Here, the pillowy mochi-like balls come two to an order in a clear, gold-hued sweet soup flavoured with osmanthus petals. The soup could use more flavour but the dumplings themselves are delicious – supple and chewy without being overly sticky and fully plumped with deliciously runny ground black sesame. 25/F, iSquare, 63 Nathan Rd, Tsim Sha Tsui, 3153 2188. Daily 11am-11pm.